A glacier is a large body of ice and snow. It forms because the snow in an area does not all melt in summer. Each winter, more snow is added. The weight of all the snow creates pressure. This pressure turns the lower parts of the snow into ice. After this happens for many years, the glacier will start growing large. It becomes so heavy that gravity causes the ice to move. It flows downwards like water but very slowly. A glacier only moves about 50 metres (160 ft) per year. New snowfalls replace the parts that flow away. Glaciers will only form in places that are cold enough and get enough snow over time. This can take a long time. It often takes tens or hundreds of years for a glacier to form. There are two kinds of glaciers: continental glaciers and alpine glaciers. Alpine glaciers are also called mountain glaciers. Continental glaciers are glaciers that spread out over a large area of land. They were created mostly during the Ice Ages a long time ago. There are still some continental glaciers in Greenland and Antarctica. They often flow downwards into the sea and break up. The broken parts that float in the sea are called icebergs. Alpine glaciers form in mountain areas. They are smaller than continental glaciers. Alpine glaciers usually flow until they reach a point where the temperature is warm enough that the ice melts completely during the summer. Glaciers are very important. They have a large effect on the environment. They do this because they are very large and heavy. When they move, they erode mountains and land. Also, since they froze long ago, snow crystals and air bubbles inside are kept in good condition. These can provide a large amount of information for scientists. Recently glaciers have been melting more than they did in the past. Many scientists think this is happening because global warming is changing the climate[source?]. Glaciers are blue in color. This is because water is very good at absorbing light. Only the strongest light, with the most energy, is able to escape. Blue is the color of light that has the most energy. Because of this, blue is the only color of light that can escape without being absorbed. The thicker the glacier is, the more blue it appears. ↑ Hambrey, Michael; Alean, Jürg (2004). Glaciers (2nd ed.). Cambridge University Press. ISBN 0-521-82808-2. OCLC 54371738. ↑ Benn, Douglas I.; Evans, David J.A. (1999). Glaciers and glaciation. Arnold. ISBN 0470236515. OCLC 38329570. ↑ * Bennett, M.R. ; Glasser N.F. (1996). Glacial geology: ice sheets and landforms. John Wiley & Sons. ISBN 0471963445. OCLC 33359888. 37536152. Walley, Robert (1992). Introduction to physical geography. Wm. C. Brown. The Simple English Wiktionary has a definition for: glacier. 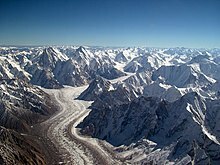 Wikimedia Commons has media related to Glacier. NOVA scienceNOW - A 7 minute video of the NOVA broadcast of July 26, 2005. Hosted by Robert Krulwich, the video is about the world's fastest glacier and why it is moving too fast. This page was last changed on 22 January 2019, at 14:09.